Home › Home and Kitchen › Infusion Water Bottle - By Viva Fresh Premium 24Oz Bpa Free Colored Fruit Inf..
Infusion Water Bottle - By Viva Fresh Premium 24Oz Bpa Free Colored Fruit Inf..
LIFE-TIME GUARANTEE - Our Infuser Water Bottle comes to you with 100% Satisfaction Guaranteed - BE AWARE OF IMITATIONS That Leak! Viva Fresh Fruit-Infused Water Bottle is Unique with a very Thick Translucent Cap, thicker than IMITATIONS. You are either 100% SATISFIED OR YOUR MONEY BACK: NO-HASSLES! Each purchase comes with Free Bonus EBOOK on: FRUIT INFUSED WATER: USES AND NATURAL BENEFITS. Thank You For Buying Viva Fresh Water Infuser Bottle! HIGH QUALITY, SAFE-TRITAN BOTTLE - Our Fruit Infuser Water Bottles are Made of High Quality, Eco-Friendly. This is Your Perfect Travel Tumbler. Very Easy to clean and Top-Rack Dishwasher Safe. It Makes a Great PERFECT GIFT for any Occasion such as Birthday, Wedding, Company Events, Mothers' Day, Fathers' Day Gift Ideas, Summer Camp, Family Reunion, Beach Party, Conferences, Mission Trips, Children Gift Packs, Spring Break Trips, Sports And Outdoor Events, etc! [Ask for Deals, Sale and Discount Coupons on Our Water Bottle Fruit Infuser]. MULTI-USE AND VERSATILE -With our Unique Fruit Infused Water Bottle You Can INFUSE FLAVOR OF YOUR FAVORITE FRESH FRUITS TO CREATE DELICIOUS THIRST QUENCHING BEVERAGES: The Easiest and Healthy Way To Hydrate And Detox! - Mix With Mint, Lemon, Lime, Citrus Fruits, Kiwi, Mango, & Strawberries - Excellent Beverage Container For The Kitchen, Gym, Yoga Class, Hiking, Camping, Office, and Traveling~~ BEST Alternative To Soda, Juice, Sports Drinks! Premium CANTEEN WATER BOTTLE and Water bottle With Fruit Infuser for runners. THE ORIGINAL BEST FRUIT INFUSED WATER BOTTLE UNIQUELY DESIGNED FOR YOU! Eco-Friendly......BPA-Free....Life-Time Re-Usable....Shatter-Proof....Easy to Use! 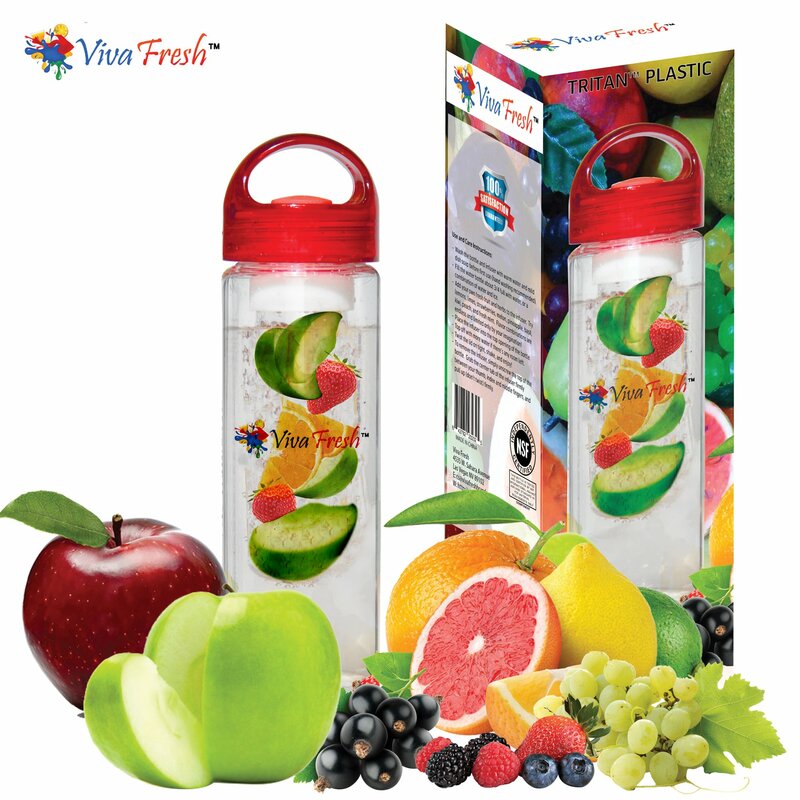 HOW TO USE VIVA FRESH FRUIT INFUSER WATER BOTTLE - Twist the Cap - Fill the removable Infuser Water Bottle Basket with your fruit of choice - Fill the Viva Fresh Water Bottle with fresh clean water. - Lock the Infuser Basket inside the bottle. Leave it for 5-10 minutes for the flavor to infuse into the water depending on the fruit. - Shake and Enjoy your favorite Fruit Infused Drinks UNIQUE FEATURES OF VIVA FRESH DESIGNER FRUIT INFUSED WATER BOTTLE - Exclusively designed to last for a life-time. - Made from Tritan Shatter-Proof, Scratch-resistance, 100% BPA Free Material - Unique Leak-Proof Flip lid top that ensures your drink remains intact on the move - Best sports, hiking, Gym, workout water bottle and fruit infuser - Dishwasher safe- (But Hand Washing recommended). - Easy to clean and reusable - Unique Dimensions: 2.7 x 2.7x 10.2 inches. - Optimum Liquid Capacity - 24 ounces=700ml. - Light Weight and Strong: 0.37 pound. Create any beverage combinations you want without having to pay expensiveprices for flavored water, and eliminate the need for expensive plasticbottles. Viva Fresh Fruit Infused Water is the ORIGINAL & UNIQUE BPA FREE and Re-usable Water Bottle for sports Men and Women! Save money, Nourish Your Health and Preserve the earth! CLICK ADD TO CART ON THE TOP OF THE PAGE TO GET YOUR VIVA FRESH BRAND OF FRUIT INFUSED WATER BOTTLE WITH BONUS E-BOOK AND LIFETIME REPLACEMENT GUARANTEE!